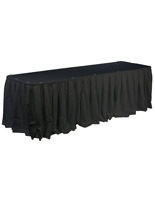 These High Quality Table Skirts Enable Party Organizers to Put on Classy Affairs! Spruce Up Boring Folding Tables with Premium Tablecloths and Covers! 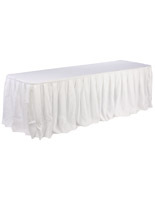 The Vast Online Catalog Sells Table Skirts Wholesale! Features hook and loop attachment for easy assembly! 10' fabric designed to cover a 6 or 8-foot-long table. 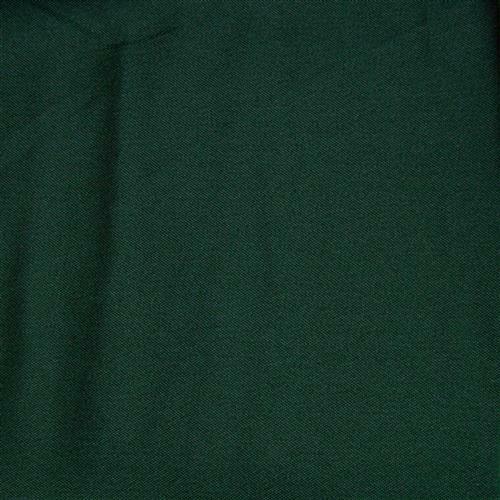 Hunter green finish matches any environment and table setting. 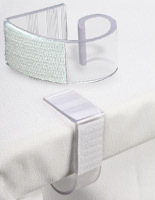 Includes table topper, skirt and clips for a complete table presentation. These tablecloths, table skirts are ideal for use in any hospitality or business-like setting, such as trade shows, conventions, job fairs, meetings, or banquets to create a uniform and professional presentation. These covers are made to fit a 6 or 8-foot-long table. 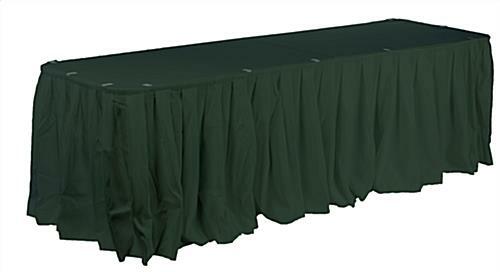 The entire table skirts package includes a hunter green table topper, matching skirting, and hook and loop clips to give users a complete solution. Make your tables stand out from the crowd with these throws. When assembling your table skirts, there are no tools required. The pleated skirting and plastic clips feature hook and loop strips. All you need to do is attach the skirting to the clips on the edge of the table and your displays are ready to go. These linen throws, table skirts are made from polyester fabric, which is a durable yet inexpensive way to cover folding tables. 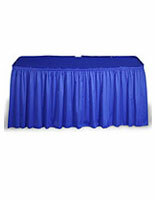 The polyester fabric enables these table skirts to be machine washable and reused for future events. Invest in these covers today and give your table a brand new look!